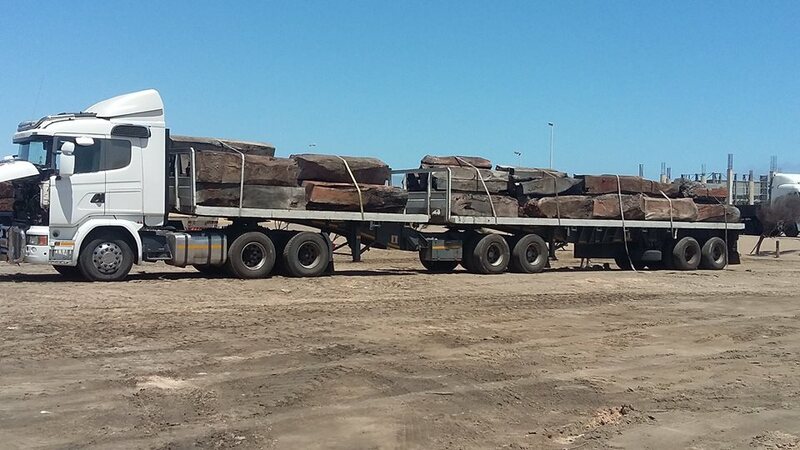 Pictured: Loads of rose wood being shifted between trucks at the Walvis Bay weighbridge to reduce overloading. Loopholes in the laws governing Namibian forestry resources are created by overlapping responsibilities by different ministries and the situation is being exploited by a ruthless conglomerate of cross-border Chinese businesses to export huge amounts of rose wood. 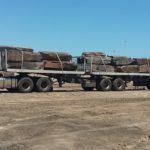 The arrival of yet another convoy of interlink trucks transporting giant blocks of rose wood in Walvis Bay has once again fanned the flames of a public debate around the relentless stripping of valuable Namibian resources without any Namibians benefiting from the true value of the wood. A conversation with the drivers of the convoy of trucks that transported rose wood to Walvis Bay revealed the exploitative chain the rose wood trade follows. One truck driver said the consignment they have transported to Walvis Bay originated in Angola. He said they load the huge blocks of wood in Angola and enter Namibia at Katwitwi from there they drive to Tsintsabis and then on to Tsumeb and Walvis Bay. The first time they encounter a weigh bridge is at Walvis Bay and they will not be able to unload their consignment in the harbour unless the trucks are weighed. The conversation also revealed that the current consignment has been lying in the forests of southern Angola for the past two years due to bureaucratic holdups with the necessary permits and licenses. Apart from allegations of mismanagement and deep-rooted corruption within the Ministry of Agriculture, Water and Forestry as well as the Ministry of Environment and Tourism that holds sway over the country’s forests starts flying every time a load of rose wood is spotted travelling to the Namibia’s main port. The main arguments in the heated debate are that the destruction of so many trees wreaks havoc on the environment from where the trees are harvested and that the local population does not benefit from the trade of the wood at all. In most cases the trees are cut down by teams of Angolan nationals that get paid anything between N$15 to N$50 per tree they fell. Apart from the illegal labour practices, the blanket payment leads to the indiscriminate destruction of entire forests with old and new growth trees. The tenant of the communal land or owner of the wood gets paid anywhere between N$10 000 and N$15 000 per cubic metre of wood once the logs are cut up into blocks. However, when the wood lands in China it can fetch prices of up to N$250 000 per cubic metre depending on the quality. The high prices fetched on the Chinese markets means that several hard wood forests in most of the Southern African countries have already been destroyed and more are decimated at an alarming rate. The harvesting and transport of any wood, which also includes firewood is regulated by law. In Namibia if regulations governing forestry – revised during 2015 – are read together with the Forestry Act of 2001 the so-called ‘own use permits’ currently utilised by wood sellers to illegally employ Angolan nationals to cut down entire forests of hard wood, does in fact not allow for the commercial export of rose wood.